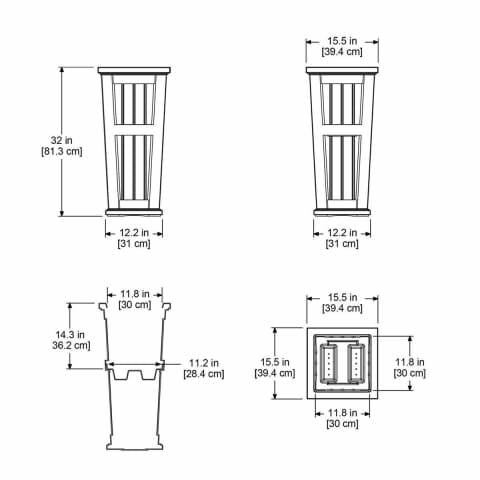 Create a sense of architectural flair that will truly deliver that New England feels with Mayne’s Cape Cod Tall Planter. This versatile container has three planting options. Remove the tray and you can plant directly into the planter, leave the tray in and plant directly onto the tray and take advantage of the sub-irrigation system or self-watering effect, you can flip the tray over and place a pre-potted planter on top. Constructed from 100% polyethylene which delivers an amazingly realistic, incredibly strong and remarkably lightweight planter. The weather-proof and ultra-tough construction allow you to enjoy your planter all year long with very little winter preparation. The UV inhibitors within the resin allow for long-lasting fade-free performance. This planter enhances the presentation of your plants without competing with them, perfect for multiple plants and larger arrangements. In addition, Mayne planters are designed to retain the right amount of moisture in the soil and protect delicate roots from daily temperature extremes. This results in healthier plants that require less frequent watering.